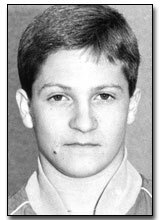 Gymnast Brian Ginsburg gained national recognition in 1982 and 1983 when he won the United States Junior National Championship. The following year, as a UCLA freshman, he finished eighth in NCAA floor exercise competition. At the National Sports Festival in 1985, Ginsburg won the Rings championship, and was named All-America in the Floor Exercise event. At the 1986 National Sports Festival, the Bruin gymnast earned silver medal honors in Floor Exercises, while winning the All-Around event at both the Brazil Cup Championships and International Cup of Champions.